HOME | ARCHIVES | FEATURES | REVIEWS | mySPACE | LAST.FM | ADVERTISING | CONTACT | RSS | <--- sign up! NOTICE » Writing positions open, see below left for more info. ALSO » Features now have a larger font. Send an to report site errors and they shall be fixed. » Full Dark, No Stars - Stephen King's new novella questions mankind's ability to trust others. » The Top 30 Albums of 2010 - Fashionably, fabulously late, our favorite music (and believe me, there was a LOT) of 2010, the year that some have called the best year for music ever. And only some of those fools work here. Plenty of usual suspects, lots of ties and a few surprises that I won't spoil, including our unexpected #1. » Live: Surfer Blood/The Drums at Lincoln Hall, Chicago, IL - Remember when Weezer used to put together records that you could sing along to and rock out to? That's what Surfer Blood's show was like! I'm really hoping that this is comedy's year. The Oscars are slowly reflecting America's fatigue of big, sweeping epics in favor of more detailed and experimental character studies (a result of our war weariness perhaps? ), and in the last couple of years, little, well-made comedies have inched closer and closer to the forefront. Little Miss Sunshine was universally beloved, and Juno [LAS feature] was so popular that it even caused its own backlash of Coldplay proportions ("How dare the mainstream recognize a movie I enjoyed?? It must not be as good as I remembered it to be!"). Could 2008 be the year for a comedy to finally win Best Picture, and give weight to the notion that a great film doesn't necessarily have to be a weighty one? Oh no no no, I don't mean Leatherheads. Heck no! Although I have to be honest, I did smile happily during the first half of the film, thinking, 'of course, it'll be George Clooney who directs that lucky comedy that brings home the gold.' And you can't really blame me. 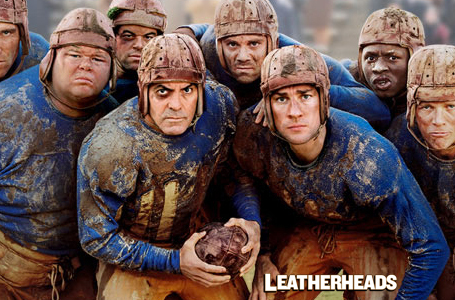 Leatherheads starts out so, so promising. Renee Zellweger is sassy, Jon Krasinski is adorable, and we all settle comfortably into our seats, anticipating Clooneyish delights galore. And for awhile, all goes as planned. The film even strikes a nice balance of being a sports movie without really involving too much actual sport, playing with the beginnings of professional football in a way that even blockheads like me can understand. Even blockheads like me get that the majority of the film's jokes lie on the presumption that we all know pro football is now hugely popular, wildly flashy, and involves lots of rules. So there I am, listening to a Randy Newman score that is nostalgic of both the 1920s and the 1980s reenacting the 1920s* thinking this could be the next The Natural or at the very least, A League of Their Own. Then, suddenly, it's 90 minutes later and I'm trying desperately to keep myself awake by finding a place to lay blame for the boring, poorly written story that is still dragging out interminably on the screen before me. 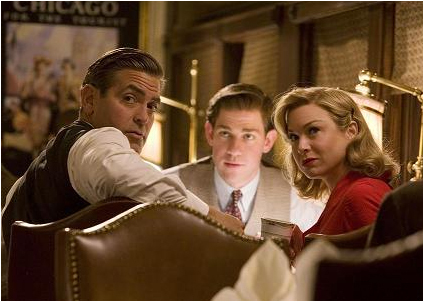 George Clooney, John Krasinski, and Renee Zellweger on the set. Believe me, I tried like the dickens to hold the screenwriters (Duncan Brantley and Rick Reilly) accountable. And to a large extent it is their fault for not tightening up their game and closing some loops, and for their eerie punishment of undeserving characters at the expense of rewarding those who should rightly be punished. But, try as I might, I can't pardon the Cloonz. A better director might have highlighted the minute parts of the script that would contain vital information for the film's second half, or at the least created more sympathy for those who win the day and less sympathy for those who don't. That's your job, Director Clooney. While we're at it, how about some screen time devoted to the colorful characters within the team? Sure, that might be a tired gag, but it would have helped a chuckle escape our lips during the visual epilogues about them at the end. That said, I can't let the actors off too easily. The group's chemistry fizzles out, Krasinski's puppy eyes begin to grate on the nerves, and though she started out strong, Zellweger turns out to be far, far away from the Katharine Hepburn-like character she clearly aspires to play. Afterwards I have a vague recollection of Clooney as some kind of shady, lovable character, but all we ever really know about the grizzled Dodge Connelly is that he has a quick wit and really, really wants professional football to get off the ground. All of the directorial and acting misfires and probably more cause Leatherheads to taper off after a strong first half and shrink into flat nothingness. I would list more of the film's shortcomings, but I am too blinded by the stinging tears of disappointment. George Clooney should stick to acting comedic roles in other directors' films; his directing talents are significant, it's true**, but I'm not sure if I can handle another one of these...Leatherheads incidents. However if the Cloonz would like to make it up to me, I would be happy to get together for drinks later to discuss the matter. *As my date said while watching the sepia-toned photographs of the title sequence pan by to the tune of a jangly piano, "I feel like we're watching an episode of Cheers." **Check out Good Night and Good Luck! For reals! A staff writer attending graduate school in Richmond, VA, Susan Howson cannot be persuaded to stop talking about movies. See other articles by Susan Howson. --> Send an with $2 in PayPal funds to cover postage. Don't worry, we'll load you up with enough to cover your town. Then just be patient. They will arrive soon. LAS has staff and freelance writers spread across North and South America, Europe, and a few in Southeast Asia as well. As such, we have no central mailing adress for unsolicited promotional material. If you are interested in having your project considered for coverage, please contact us before sending any promotional materials - save yourself time and postage! Updated whenever, forever. All contents © 1998- LAS magazine. All rights reserved, et cetera.